Provide comfort for the family of Mary Bruno with a meaningful gesture of sympathy. Mary was born January 23, 1946 in Hogansburg, the daughter of the late Andrew and Agnes (Lazore) Tarbell. She attended St. Regis Mohawk and Salmon River Central School and later achieved her GED while living in North Carolina. She was previously married to Vincent Bruno, they were blessed with a son. Mary lived and worked in North Carolina for many years before moving back to the Reservation. She enjoyed reading and collecting various knick-knacks, especially roosters. She is survived by her companion of 10 years, Thomas Terrance; her son, Vincent of North Carolina; her sister Nancy and Charles Markham; two brothers, Mike and Marilyn Tarbell, and Roy and Caroline Tarbell; and many nieces, nephews, and cousins. Friends may Friday 2-4 and 7-9:00 PM at the Donaldson Funeral Home, Massena, where funeral services will be held Saturday 11:00 AM with Rev. Jerome Pastores, officiating. Burial will be held later in the spring in Kateri Cemetery. 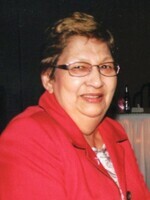 Memorial contributions may be made in her memory to St. Jude’s Children’s Hospital or the Akwesasne Death Benefits Group. Memories and condolences may be shared online at www.donaldsonfh.com. To send flowers in memory of Mary D Bruno (Tarbell), please visit our Heartfelt Sympathies Store. Donations are being accepted for: ST JUDE CHILDRENS RESEARCH HOSPITAL INC. Provide comfort for the family of Mary D Bruno (Tarbell) by sending flowers. My heart felt sympathies goes to you.It is not easy to loss someone we dearly love.God's word called death as an "enemy".None of us can outrun it or fight it off. But God is far more powerful than death.He is the loving rescuer who has already shown that he can defeat this enemy.And he promises to destroy this enemy, death, once and for all. In scriptures says that "The last enemy, death, is to be brought to nothing.” 1 Corinthians 15:26 Our dear dead loved ones will be brought back to life, through "Resurrection". “Your dead will live. My corpses will rise up.Awake and shout joyfully, You residents in the dust!For your dew is as the dew of the morning, And the earth will let those powerless in death come to life. "-Isaiah 26:19 These promises from God's word always gave me comfort and hope I wish and hope that it will give you some comfort in this difficult time! Heartfelt Sympathies Store purchased flowers for the family of Mary Bruno.